Last week was rough. On Monday, Little Man started daycare. This, after a year and half of being cared for by his grandparents. But while the grandparents could care for a baby cooing in a crib. their achy knees don't allow them to run after a shockingly fast toddler. Plus, Little Man needs to be around other little kids. Or so we tell ourselves. And so, I dressed Little Man in a crisp white shirt (rookie mistake) and his navy blue Chuck Taylors with the Velcro straps. We took a picture before leaving. Me, trying to hold on to a baby who is clearly no longer a baby. And Little Man trying to escape my arms to continue running around the table. In the picture, Little Man looks mischievous. Mamma looks mussy and tired. In short, business as usual. And yet, the moment felt somehow more significant than the hundreds of Mamma and Little Man moments that make up each day. As soon as we entered the daycare, Little Man knew something was wrong. He turned right around and tried to march right outside. The determined attempt to leave was followed by a death grip on his Baba's leg followed by plaintive cries, "No mamma, nooooo." No amount of pointing to the blocks and the carefree kids eased his anguish. The daycare instructor gently took him and simultaneously ushered us out the door but that one second was enough to see the terrified and disappointed expression in Little Man's eyes. Little Man thought we were abandoning him. And walk out we did. Except I spent the next ten minutes crouched on the porch, in the rain, hearing Little Man continue crying inside. At some point, the Hubster ushered me to the car where I continued crying. And I cried on the train to work. I may have had to rush out of a presentation because I was about to, you guessed it, cry some more. To the colleague giving the presentation, it wasn't you. It was clearly me. I was a hot mess and I'm sorry. The sadness was so overwhelming, the only thing left to do was bake. And so at 11 p.m., I baked these mini banana muffins. And because I'm a firm believer in the healing powers of chocolate, I added some chocolate chips to the muffins. Oh, and some peanut butter cups because well, we needed extra healing this week. And the next morning, Little Man and I shared a muffin for breakfast as my way of reassuring him that we'd always come back for him. And we went through the same grueling routine again. Every parent who has gone through the daycare transition tells me it will get better. That there will come a time where he will hop out of the car and run in to play with his friends without so much as a backward glance at his Mamma. But that day was not today. It most likely won't be tomorrow or the next either. And so, I'll continue making muffins. And he and I will share them for breakfast. And after I drop him off, I'll sit outside the daycare in my car, shoveling muffins in my mouth while tears run down my face. And though I know we'll get through this week with or without muffins, I'm glad it's the former. Preheat the oven to 350°F. With a wooden spoon, mix butter into the mashed bananas in a large mixing bowl. Mix in the sugar, egg, and vanilla. Sprinkle the baking soda over the mixture and mix in. Add the flour and mix. Add chocolate chips and peanut butter cups and mix (mixture will likely be a bit lumpy). Line mini muffin pan with liners. 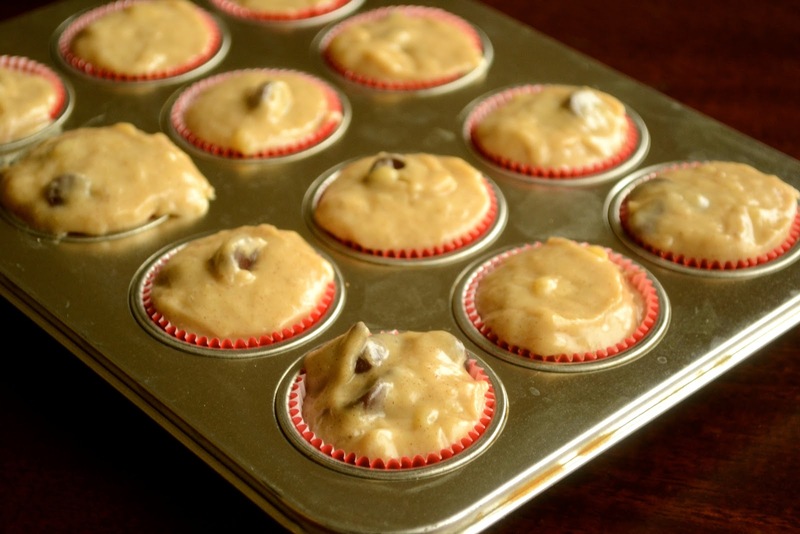 Pour mixture into each muffin cup (I like to fill each cup heaping full so the muffins bake up with a nice domed top). Bake for 18-20 minutes. Awww, it's a big step! Hope your little man adjusts quickly. These muffins look great! I'm crying for you. It is a hard transition and yes one day he will run from the car and be in such a hurry he won't have time to say good-bye. I feel for you though, my sil just sent my nephew off and I think it's much harder on her than it is on him. Hopefully the muffins helped cheer you up a bit. They sound wonderful to me. Hoping this week will be much better for you. Such a beautiful post. I don't have kids, but I felt your pain. That's tough.. eventhough kids are so much work and drain you, that is painful hearing them cry and seeing fear in their eyes. 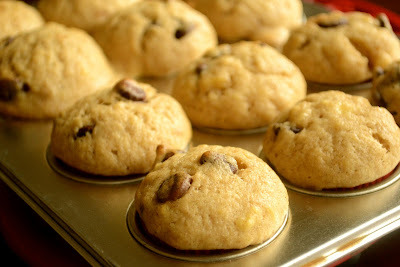 I'm glad the banana muffins helped you out, baking helps relieve some of my stress as well when life isn't so perfect. These babies look awesome! Touching post! You know why you are a good mom? Because Little Man cried when you dropped him off. Maya? She went in happily and never once cried for me. Not one tear. Not one! I felt like the world's worst mother. The muffins look delicious my friend. Hang in there! ooh, I hope that things get better. this is so sweet. Awww, I hope things are better! These muffins look incredible though! I can understand how you feel, I feel the same every time I leave home, half heartedly thinking, if only we are in paleo times and I can be a stay-at-home mom! And I must add, the muffins are divine with addition of the choc chips! I can't imagine how this must hurt, but chocolate does help pretty much any situation. I hope it gets better soon. They are shockingly fast, arent they? Such a sweet post. I am sure it hurts to hear him cry like that. But I am also sure it will get better. Much, much better. In the meanwhile, I am sure the baked yummies will help. Hugs, Azmina! This must be such a difficult transition for you and Little Man. I don't have experience in this area yet, but just looking at these comments, it looks like it will get better. Until then, major HUGS! I know what you mean about chocolate + peanut butter = comfort, particularly where baking is involved. Take care, Azmina! I still have several years before this day...but my heart already breaks! I know that it will get better for you and your little guy. 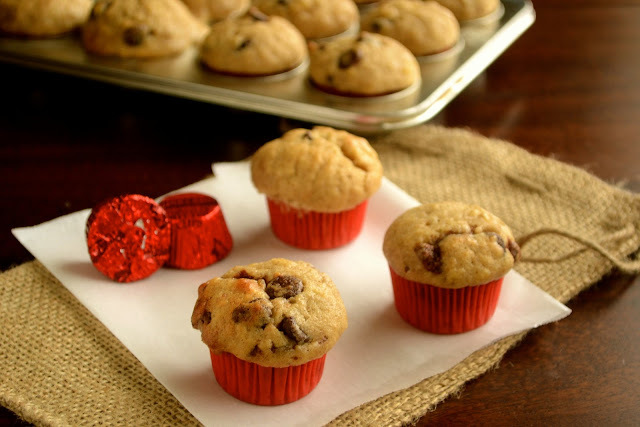 And these muffins can do a lot to help a hard week. I adore bananas, and I could probably eat at least three of these in one sitting! Thank you for sharing! My sister reacted to preschool the same way your son is reacting to day care...and I can promise it DOES get better! But I can also see why baking and stress eating is in order. And these muffins look like the perfect way to go about it! My heart goes out to you. But pretty soon (maybe even already) he will be so happy at daycare that he won't want to leave when you come to pick him up. And that's the best sign of all that you have chosen the right place! Azmina - I can't believe that he is going to day care. I am sure it was hard on you but I am sure he is in good hands and can make new friends. These muffins look divine! I cried reading your post, Azmina. It was hard enough for my 20 month old to cope with the few times we had to change her nanny, all the while being at her known space. We are also at a point to send her to daycare thinking she needs to be around other kids and can totally imagine how terrifying the experience may be for the little ones. I hope your little man is all settled in by now.